In the latest novel in Genevieve Cogman's historical fantasy series, the fate of worlds lies in the balance. When a dragon is murdered at a peace conference, time-travelling Librarian spy Irene must solve the case to keep the balance between order, chaos...and the Library. When Irene returns to London after a relatively straightforward book theft in Germany, Bradamant informs her that there is a top secret dragon-Fae peace conference in progress that the Library is mediating, and that the second-in-command dragon has been stabbed to death. Tasked with solving the case, Vale and Irene immediately go to 1890s Paris to start their investigation. Once they arrive, they find evidence suggesting that the murder victim might have uncovered proof of treachery by one or more Librarians. But to ensure the peace of the conference, some Librarians are being held as hostages in the dragon and Fae courts. To save the captives, including her parents, Irene must get to the bottom of this murder--but was it a dragon, a Fae, or even a Librarian who committed the crime? Genevieve Cogman is a freelance author who has written for several role-playing game companies. She currently works for the National Health Service in England as a clinical classifications specialist. 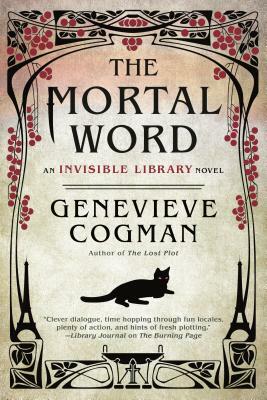 She is the author of the Invisible Library series, including The Mortal Word, The Lost Plot, The Burning Page, The Masked City, and The Invisible Library.